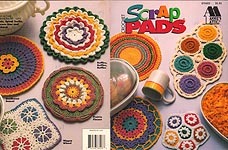 Crochet Scrap Pads, designed by Deborah Levy- Hamburg, Annie's Attic, 1995. Designs include: Fiesta, Popcorn Star, Prairie Flower,Ruffles Ruffles Ruffles, Southwest Sunset, Sprial Trellis, Starburst, Wagon Wheel. Excellent condition. 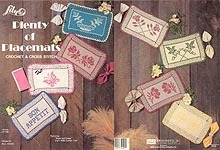 Crochet Scrap Pads, designed by Deborah Levy- Hamburg, Annie's Attic, 1995. Designs include: Fiesta, Popcorn Star, Prairie Flower,Ruffles Ruffles Ruffles, Southwest Sunset, Sprial Trellis, Starburst, Wagon Wheel. Numbers on cover and by pattern names to match photos to instructions; otherwise, very good used condition. 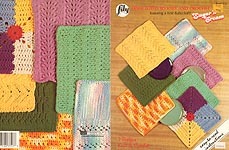 Lily Dishclothes to Knit and Crochet, B. Blumenthal & Co. Inc., nd. Designs include: KNIT Open Chevrons, Eyelet Lattice, Crossed Rib, Ostrich Plume; CROCHET Crossed Stitches, Vertical Clusters, Cornered Granny. "60" written inside, tags on cover. Otherwise, very good used condition. 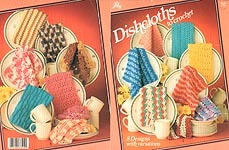 Lily Dishclothes to Crochet, designed by Vicki Neil Scott, B. Blumenthal & Co., Inc., 1987. Designs include: Ripple, Cluster Stitch, String, Crosshatch, Granny Square, Butterfly, V Stitch, Wave Stitch, and each design also has one variation. This one looks rather messy as the former owner has numbered both the cover and the patterns to tell which photo goes with which, and has also put "finished" next to some of the patterns. 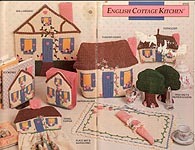 English Cottage Kitchen, designed by Elizabeth White, Annie's Attic, 1990. Designs include: Wall Hanging, Toaster Cover, Potholder, Towel Topper, Napkin Holder, Placemat & Napkin Rings, Bookends, Tree Salt & Pepper Covers. Sticker removal scar on front cover; otherwise, very good condition. 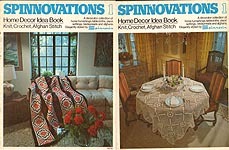 Plenty of Placemats - Crochet & Cross Stitch, Designed by Bill Icard, Lily Craft Products, 1984. 8 designs to cross- stitch on placemats crochet with Sugar 'n Cream cotton yarn: Bon Appetit, Snowflakes, Flower Bowl, Roses, Butterfly, Poppies, Branches, Thistles. "20" written on cover, but overall very good condition. 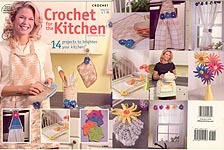 Crochet for the Kitchen, designed by Svetlana Avrakh, American School of Needlework, 2006. 14 projects, including: BLUE POSY Apron, Curtain Trim & Tieback, Utensil Holder, Dishcloths, Hot Pad, Place Mat, and Towel Topper, and VIBRANT BLOSSOMS Apron, Dishcloth, Curtain Trim, Place Mat, Towel Topper, Scrubbie, and Blossoms. Excellent condition. 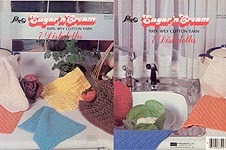 Sugar 'n Cream KNIT 7 Dishcloths, designed by Pat Harste, Lily, 1987. 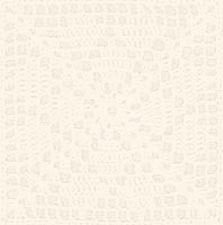 7 designs to KNIT in 4 ply cotton yarn. Very good condition. 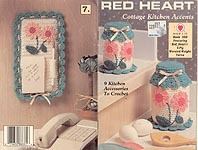 Red Heart Book 359: Cottage Kitchen Accents, Coats & Clark, 1991. Designs in worsted weight yarn include: Storage Jars, Rug, Utensil Holder, Table Pad, Napkin Holder & Ring, Placemat, and Notepad & Pencil Holder. Some cover wear, but overall good condition. 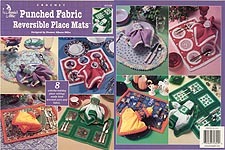 Crochet Punched Fabric Reversible Place Mats, designed by Elanor Albano- Miles Annie's Attic, 2000. 8 colorful place settings made from worsted yarn and fabric. Like new. 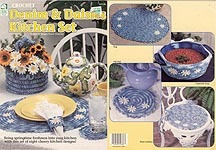 Crochet Denim & Daisies Kitchen Set, designed by Maggie Petsch Chasalow, House of White Birches, 1998. 8 cheery kitchen designs in worsted weight cotton yarn accented with size 10 crochet cotton: Place Mat, Hot Pad,Coaster, Napkin Ring, Basket Casserole Cozy, Chair Cushion, and Rug. Very good condition. 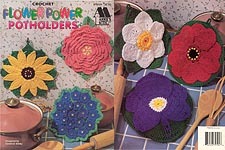 Crochet Flower Power Potholders, designed by Cameron Sibley, Annie's Attic, 1996. 6 designs in worsted weight cotton yarn include: Daisy, Rose, Hydrangea, Daffodil, Violet, and Poppy. Like new -- may have very very faint scent of fabric softener sheet. 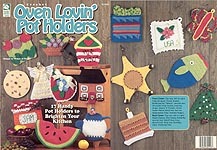 Crochet Oven Lovin' Potholders, designed by Women of Design, House of White Birches, 1996. 17 designs crocheted in worsted weight cotton yarn: Tulip Bouquet, Flower Basket, Birdhouse, Chocolate Chip Cookie, Cooking Angel, Hearts 'n' Flowers, Home Sweet Home, Jam Jar, Watermelon Slice, Teapot, Cactus, USA Stamp, Butterfly, Fish, Sheriff Star, Birthday Cake, Christmas Tree. Like new. 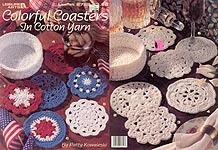 Colorful Coasters in Cotton Yarn, designed by Patty Kowaleski, Leisure Arts, 1995. Crochet 6 different coasters and holder in cotton worsted weight yarn. Pattern booklet is "much loved" -- but everything is intact and readable. 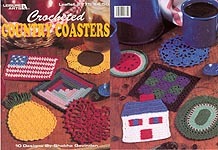 Crocheted Country Coasters, designed by Shobha Govindan, Leisure Arts, 1995. Ten designs in size 10 crochet cotton include: Flag, Round Blue, Watermelon, Log Cabin Quilt, Heart, Pineapple, Nine- Patch Quilt, Oval Rug, House, and Sunflower. Excellent condition. May smell slightly of fabric softener sheet. 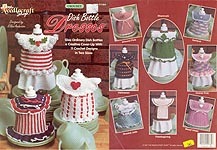 Dish Bottle Dresses, designed by Ellen Anderson, The Needlecraft Shop, 1997. 11 designs crochetd in size 10 crochet cotton; each design can be modified to fit two different sizes: Holiday Petticoat, Almond Pink, Wood Violet, Orchid Pink, Shaded Jade, Thanksgiving, Halloween, Garland, Christmas, Valentine, St. Patrick's, Fourth of July. Light pencil checkmarks beside one pattern, but otherwise very good condition. 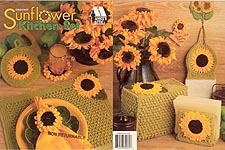 Sunflower Kitchen Set, designed by Mickie Akins, Annie's Attic, 1993 Place Mat, Napkin Holder Cover, Toaster Cover, Towel Topper, Potholder, Coaster, and Napkin Ring crocheted in worsted weight yarn with Sunflower made with sports yarn; Fridgie in size 10 crochet cotton. Like new. 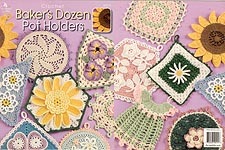 Crochet Baker's Dozen Potholders, Annie's Attic, 2002. Thirteen gorgeous (and useful) designs in size 10 crochet thread. Excellent condition. 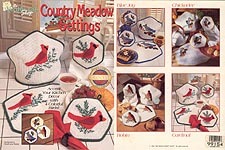 Country Meadow Settings, designed by Rosemarie Walter, The Needlecraft Shop, 1999. Crochet matching tea cozy, place mat, pot holder, and towel topper in worsted weight yarn, in your choice of Cardinal, Robin, Blue Jay, or Chickadee. Birds are crocheted separately and sewn on; details are embroidered. Like new -- may have very very faint scent of fabric softener sheet. 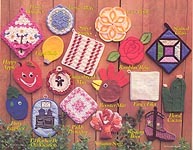 Annie's Attic Potholders A'Plenty, Annie's Pattern Club, 1985. Collectible digest-size booklet contains patterns for: Crocheted Daisy Bouquet, Happy Apple, Flirty Eggplant, Light Bulb, Flower Palte, Super Stripes, Lacy Petal, Rooster Mit, Fancy Filet, Floral Cactus, Wsetern Book, and pink Paddy Protector; plus Quilted Stained Glass, Ramblin Rose, Autum Song, and "I'd Rather Be on Vacation." Slight page yellowing, but otherwise near mint. Annie's Attic Potholders A'Plenty II, Annie's Pattern Club, 1985. 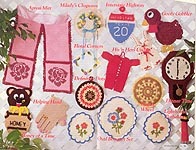 Collectible digest-size booklet contains patterns for Crochet: Apron Mitt, bear with honey pot, Helping Hand, hat, Floral Corners, Interstate Highway sign, Goofy Gobbler, His & Hers Undies, Wagon Wheel, Definitely Dots, Lighthouse Potholder, clock, and 3-piece Oval Bouquet set. Excellent condition. 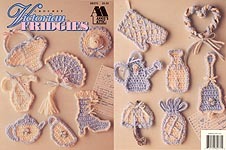 Annie's Attic Crochet Victorian Fridgies, designed by Ann Kirtly, Annie's Attic, Inc., 1993. Designs in worsted weight yarn include: Lace Fan, Summer Bonnet, Milk Bottle, Parasol, Flower Basket, Watering Can, Heart Wreath, Oven Mitt, Teacup, Teapot, Pineapple, Bell, and High- Button Shoe. New. 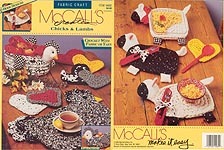 McCall's Creates Chicks & Lambs, designed by Claudia Larrabure, The McCall Pattern Company, 1992. Combine crochet with fabric or yarn and sewn heads to create Chicken Basket, Chicken Placemat, Heart Trivet, Lamb Placemats, and Lamb Casserole Caddy. Very good condition. 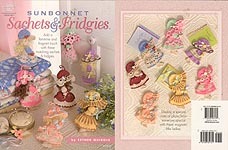 Annie's Attic Sunbonnet Sachets & Fridgies, designed by Esther Quirole, Annie's Attic, 2007. 7 matching sachets & fridgies (could also be used as Christmas ornaments!) worked in size 10 crochet cotton and embellished with ribbons, roses, and craft doll hair. Like new. 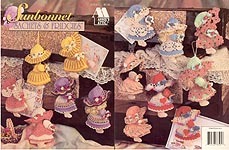 Annie's Attic Sunbonnet Sachets & Fridgies, designed by Esther Quirole, Annie's Attic, 1995. 7 matching sachets & fridgies (could also be used as Christmas ornaments!) worked in size 10 crochet cotton and embellished with ribbons, roses, and craft doll hair. Excellent condition. 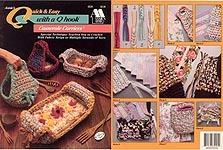 Annie's Attic Quick & Easy Casserole Carriers with a Q Hook, designed by Annie Potter, Annie's Attic, Inc., 1992, 1994. Special Technique teaches you to crochet with a giant Q hook and fabric strips or multiple strands of worsted weight yarn. Round, Square, and Rectangular carriers, plus full instructions on cutting and crocheting with fabric strips. Like new. 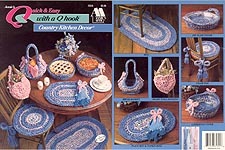 Annie's Attic Quick & Easy Country Kitchen Decor with a Q Hook, designed by Annie Potter, Annie's Attic, Inc., 1992. Designs with the look of Grama's rag rugs, created with a giant Q hook and multiple strands of worsted weight yarn, include: Place Mat, Napkin Ring, Bread Basket, Casserole Cover, Pie Plate Cover, Heart Pocket, Rug, and Chair Pad. Excellent condition.